lightening and balancing, and breaking in are all part of the effort necessary to create winning engines for model racing events. 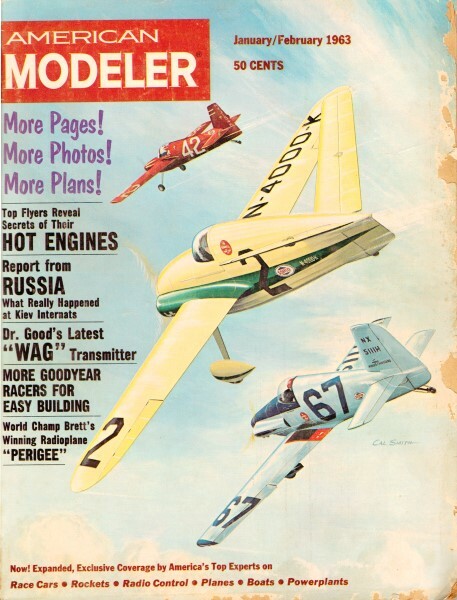 This 1962 American Modeler article predates Schnuerle porting (in model engines), ABC cylinder liners, and modern metal alloys, but still the concepts are applicable to today's engines. Wankel loves will appreciate the homemade engine shown. Larrv Conover and Warren Kurth join forces to bring you this vital series; Part 2 next issue! 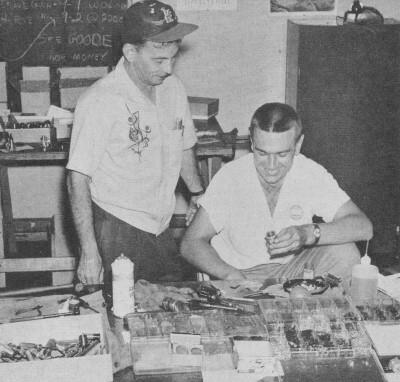 This has become one of the traditions of annual air-model National championships: motor repair service operated by K&B. John Brodbeck (left) and Bill Wisniewski try to figure how contestants can beat 'em up so. This report on speed and engine re-work is designed to give a comprehensive insight into the methods and general approach used by experts in our various gas powered events. This includes both control-line and free-flight power. Perhaps the most important information we can pass on is the use of a scientific method for improving the performance of your models. 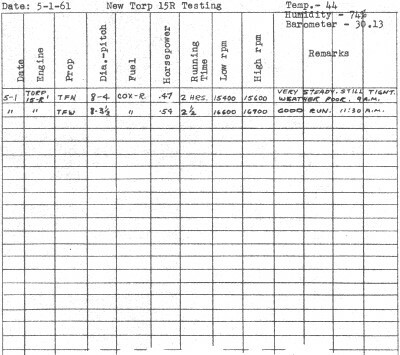 We will refer to the measurement and recording of rpm readings throughout the text. The results you derive from "re-working" depends on your ability to accurately measure changes in engine HP. The best way is with the use of a good tachometer. So tachs are covered in this article. Yes, you may be wondering why the engine manufacturer, with all his professional know-how, can't put an engine on the market with ultimate performance built into it. First of all, if it is to sell to the mass market it must operate easily and efficiently over a variety of speeds and loads. By contrast., the hopped up speed engine is tuned to operate at one specific high rpm while drinking large quantities of expensive highly nitrated fuels. The modifications may also make it harder starting and critical to operate. If it is run at a lower rpm its power will drop off rapidly. Second reason is the limiting factor of economical production. The manufacturer can not afford extensive hand work, or special materials (example: precision ball bearings) if he is to keep the cost of his product within reach of the average modeler. Engine rework can be classified under three main headings: RE-TIMING, CLEANING-UP, and FREEING-UP. The last two terms are overworked catch-alls, but they do include some basic methods and operations, so we explain them in general. RE-TIMING: The trend is to engines which turn faster on smaller props, and develop peak HP at high rpm. Many endinges can have their rotary valve timing modified to give better performance in the 20,000 to 25,000 rpm range. Usually, opening the. rotary valve port so that the intake closes later in the cycle will help. In fewer instances, opening the valve port to let the intake open earlier may help, too. But remember, the exact timing to be used is dependent upon several factors: Peculiarities of the engine, its compression ratio, rpm at which it is expected to run, diameter and length of venturi, bore-stroke ratio. All these factors are interdependent, a change in one will nave an effect on the rest. For example: Generally the rotary valve is still open for 40 to 60 degrees after the piston has started its downward motion, building up crankcase pressure, and tending to force the fresh charge of fuel vapor back out the venturi, However, the momentum of the incoming fuel charge, due to its velocity build-up in the venturi, will continue to carry fuel into the engine despite back pressure being developed by the descending piston, As rpm increase, .this fuel charge velocity and momentum builds up, therefore we can change the timing and leave the valve open a wee bit longer. Another thing we can do if we are going to run only at high rpm is to change the cylinder port timing. Top edge of intake port may be filed ,upward to let the port open earlier. Again, depending on the particular engine, the exhaust port may be filed upward a greater or lesser amount than the intake port. Height of piston baffle or dome will have some effect on timing. Filing down the top of the baffle, or leveling it off on the intake side helps with some engines. An interesting extreme is the Italian Super Tigre 15 which has no baffle on top of a flat piston, while the intake and exhaust ports in the cylinder open almost simultaneously. "CLEANING-UP": This is a term used to define all the modifications which make for easier passage of the fuel mixture from the venturi opening to the combustion chamber. Most obvious suggestion is to polish all surfaces over which the fuel mixture must flow, and to radius and streamline all edges over which the mixture passes. Polishing thus includes the connecting rod, crankshaft counterbalance, crankcase, bypass, and the inside of the crankshaft - if the engine has a front rotary valve. The lower outside edge of the cylinder intake port can be streamlined. Also the lower end of the bypass, the edges of the connecting rod if it has a rectangular cross-section, and - if a front rotary valve - the rear opening of the fuel passage. On some front rotary engines, the venturi opening and crankshaft port opening may be lengthened and squared out to match each other. Rear edge of shaft port can be radiused (details later) and if shaft-port has been put in by milling flat across shaft, excess material may be ground away. But be careful throughout all these operations that you don't accidentally grind past the edge of the port and change the timing. Remarkable engineering feat 2 years in development: revising Wankel "pistonless" internal combustion engine for 2-cycle running. Floyd Nell, St. Louis, did it: .50 c.i.d. ; 10,000-rpm; all steel; ball & needle bearings; 20-oz. On some engines it helps to open out the throat of the venturi, but opening it too much can give negative results. The optimum venturi size will vary with different engine set-ups (rpm, timing, engine layout) so here again, investigate before you operate. If your engine has a front rotary valve and uses a rear crankcase cover, round off the cover so that it does not obstruct the lower end of the cylinder bypass. In general, the foregoing operations which comprise "cleaning-up" an engine will produce the least gain per time expended in re-working and are of lesser importance than the re-timing of "freeing" modifications. One other point worth mentioning here is compression ratio - both cylinder compression and base compression. The cylinder compression ratio may be varied for better performance, but the governing factor will be the fuel you will be using and to some extent the glow plug and cylinder timing. Most of the racing engines now have compression ratios pretty well on the high side as they come from the factory. An old trick, especially with the various McCoy engines, was to increase the base compression or "pack the crankcase" by various means such as thinning down the connecting rod and shortening the crankpin, which allowed facing off the crankcase to reduce Volume. 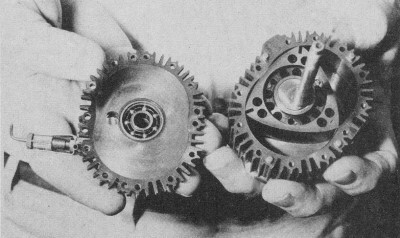 The lightening holes in the rotor disc were plugged with balsa also to reduce the crankcase Volume. Such methods which worked well at lower speeds generally are not satisfactory at today's high rpms. 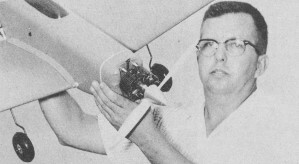 "FREEING-UP": This includes all the methods used to decrease mechanical friction in the engine so that the greatest percentage possible of the energy released in the combustion chamber can be transformed into useful horsepower at the propeller. First step is cleanliness. This is extremely important. .Any re-working of parts should be finished off with crocus and oil (or jeweler's rouge and oil) to remove any trace of roughness. Then after any polishing or lapping, the parts involved must be thoroughly scrubbed with a small stiff brush in hot soapy water. It is imperative that every trace of foreign matter be dislodged from the pores of the metal or the engine will soon grind itself to a worthless mess. Many a good engine has been ruined at this point by a too-hurried cleaning. Some engines as they come from the factory have the piston-cylinder fit set up just a little too tight for high speed running. It is advantageous to lap these out a little with jeweler's rouge or a fine grade of rubbing compound. It will take some experience, or the advice of an expert on that particular engine to know how much to lap. The engine must not be lapped out so much that it loses its compression. Generally, as our operating rpm goes higher, we can stand a little more compression loss for the sake of a free fit. Also, some engines benefit from a fine polishing of all the wearing surfaces before they are even broken in. The diametral clearance between the crankshaft and its bearing, on a plain bearing engine, is important for free running at high rpm. Usually .001" for a 1/2A and .002" for larger engines is the minimum acceptable - although in some cases, double this amount of clearance will improve performance. The bearing of a ball bearing engine should feel absolutely free of any tight spots or roughness. So be careful to always keep bearings free from dirt, and so not touch the ball races themselves. Perspiration from the fingers will ruin them. A few drops of light oil after each day's running will help keep moisture from collecting on the bearings. Some modelers replace the ball bearings in their engines with high speed precision bearings, but there is a catch here. The running clearance of a high speed bearing is just as important, if not more so, than its precision for this clearance determines the actual sliding friction and the loads imposed on the balls when the engine is running. A precision bearing with the wrong internal clearance may do more harm than good. Along this same line, the shaft fit in the bearing is very important. So it's best to consult the bearing manufacturer for your particular application. Port hooking is another robber of power. This is caused by the side loads which result in slight tipping of the piston in the cylinder. What happens is that the top lip of the piston catches on the top of the cylinder ports as it travels past. A very slight radius or chamfer put on the piston lip and on the inside edges of the cylinder ports will alleviate this. Some engines have this already done when they come from the factory. Go very easy when doing any work inside the cylinder. Any re-working which reduces the the strength of the part involved should be held to a minimum. The more we reduce the strength of any part, the more it distorts under load, causing binds and friction. And the net result may be a power loss instead of a gain. This is a very important point to weigh when considering any reworking. Turning down of cylinder fins is generally best avoided. Certain internal stresses are set up in the metal of the cylinder when it is machined. When the outside fins are turned down after the manufacturer has honed the cylinder to shape, some stresses are released, which may disturb the balance and warp the cylinder. When all the re-working has been done, the engine should be assembled carefully, tightening all screws slowly and evenly, while checking for any binds in the engine. If any binds are felt, the cause must be found and corrected before the engine is run. Here's how a dedicated researcher records his data on engine performance; accurate measuring devices are absolute "must." BREAKING-IN: This should be accomplished in a series of short one minute runs at high speed, using a speed fuel that has plenty of oil in it. The reason for the short runs is twofold - to prevent heating and to let the engine break in quicker on less running time. The number of heating up and cooling off cycles is a factor in break-in. It is best to break-in an engine at approximately the same speed that it will be run in the air. The wear pattern on the moving and bearing surfaces changes with rpm because the inertia forces of the reciprocating parts increase and the effective pressure in the cylinder decreases with increasing rpm. By holding to one approximate rpm throughout the life of the engine we have a better chance of keeping a nice smooth wear pattern. Take for instance a plain crankshaft bearing which tends to become oval as it wears. If we run it at various speeds it will, instead, assume a rough clover leaf shape which produces extra friction and vibration. Also at higher rpms there is less chance for shellac deposits to form on the cylinder walls. This deposit, often referred to as engine varnish, usually occurs with a new engine which is tight. A combination of tight fits, damp weather, and fuel ingredients cause it to form. You spot it first when the rpm starts to sag and the engine heats up abnormally. The engine loses it free feeling at the top of the stroke (plug out). You can see it on the cylinder looking through the exhaust port ... a sort of brownish film. It may be a little hard to recognize the first time, but when you clean it off you will see the difference. There is no choice. You have to remove it. Remove the cylinder and clean it with fine grade steel wool. Molybdenum disulphide is an additive which should be used during break-in, either in the form of a sub-micron powder which can be mixed directly in the break-in fuel, or as an oil base suspension. Molyfilm, an oil suspension, has become the most popular form of molybdenum disulfide with the speed fans. It is classified as a solid lubricant, a slippery powder that has an affinity for soaking into the pores of the metal and makes a thin film as little as one-millionth of an inch thick. This prevents metal-to-metal contact and reduces the tendency for galling and seizure. The result is a reduction in running time needed for parts to mate properly, and a reduction in engine wear during break-in. Assuming that your engine has the basic layout and timing needed for speed work, this business of "freeing-up" will have more to do with your engine output than any other factor. LIGHTENING AND BALANCING: We might consider briefly this additional type of modification. So far very little has been accomplished in this area, and then only via extensive experimenting. By removing some weight from the reciprocating parts-piston, connecting rod, and wrist pin - we reduce the inertia forces which the motor must overcome when it changes direction twice every revolution. The net result is faster acceleration of the piston during each stroke, and lighter loads on the bearings. However, there is usually not a great deal for us to do here, since we encounter problems of distortion and resultant binding when too much metal is removed. Also, the manufacturers have improved this feature steadily over the years. Balancing is another problem. Since the inertia forces caused by the reciprocating parts vary with different rpms, it is impossible for an engine to be perfectly balanced at all speeds. Therefore, it becomes a problem of balancing the system for the specific rpm you wish to operate at. Unless you have a bad vibration problem it is best to leave this balance set up as designed. If you do have excessive vibration you should first check for unbalanced props, poor motor mounting, or a bent shaft. So there you have the basic ingredients of a hop-up job. If you would like more detailed recipes for your particular engine, go to contests and talk with some of the experts. There have been some helpful hop-up ,articles in the past. Dynamic Models Inc., 13755 Saticoy Street, Van Nuys, Calif., has published some very good information on this subject in their "Tech Tips" ... their issue # 6 deals specifically with reworking engines. Obtain same by writing to the company.